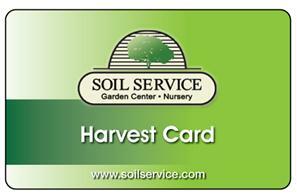 SOIL SERVICE NEWS- HARVEST POINTS, SEEDING/LANDSCAPING RESERVATIONS, DROOPY PLANTS, SUMMER WEEDS AND MORE! Just a reminder that July and December are the months to redeem Harvest Points. 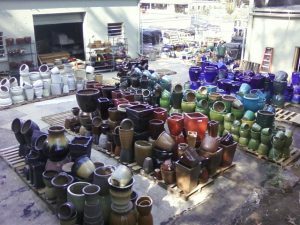 Use your points to buy ceramic pots (new shipment just arrived at the Garden Center), plants, sale items, grass seed and fertilizer for fall or whatever else catches your eye. Have fun with your Harvest Points! Labor Day to mid-September (especially in shade) is the best time in Kansas City to seed your lawn and July is the best time to evaluate it. 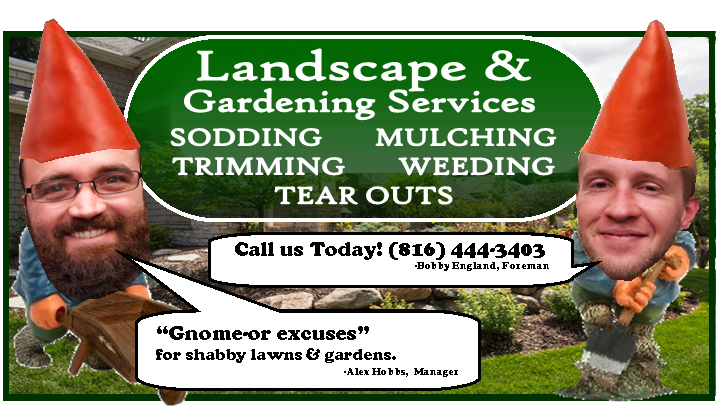 EARLY FALL is by far the best time to go all out for a fabulous lawn next spring. 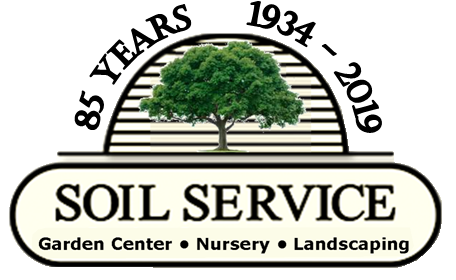 Our Garden Center landscape crews can aerate, verticut, seed and apply starter fertilizer for you. Please let us know ASAP if you need to sign up for these services since our schedule fills quickly, and you want to take advantage of the best time of year for success. While you’re planning fall seeding, take a good look at the picture below. This picture comes from a Garden Center employee’s yard on the right and their neighbor’s yard on the left. Notice the color difference? We promise you this is an unretouched photo and the differences are even more striking in person. 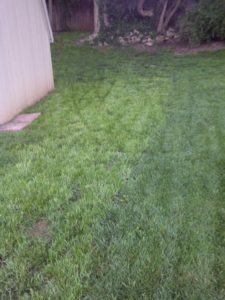 Both grasses were mowed the same day and fertilizer, water or soil type is not why they are different. We’ll have more details in the August email newsletter but here’s a hint. Cheap grass seed is costly!!!!!! Some plants may have droopy leaves in the middle of the day if heat and wind kicks up. Plants droop when leaves lose more water thru evaporation than roots can supply. Assuming the plant is in the right spot for its sun/shade needs, it doesn’t always mean the soil is dry. Before grabbing the hose, wait until the next morning to see if they perk up. If so, they may not need water. Reduce the odds to over water by putting your finger an inch or two in the ground near the plant base. If the soil is moist you can probably hold off on watering and check again in a few days. Our June email had some watering tips but here is an excellent lawn watering guide from MU. 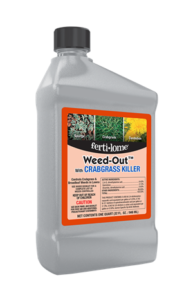 Ferti-lome Weed-Out with Crabgrass Control is used in summer for a wide assortment of broadleaf weeds and crabgrass in lawns. It’s available in ready-to-spray for small areas and hose-end or concentrate for large areas. Apply in early morning when it’s cooler. If drought persists, water weeds a day or two before applying. This increases product uptake for better control. TAKING OUT A LARGE TREE? When a large tree is cut down, what’s left behind is when the trouble starts. If you can’t have the roots taken out, grind the stump down as far as possible (at least 12 inches if the grinder goes that deep). 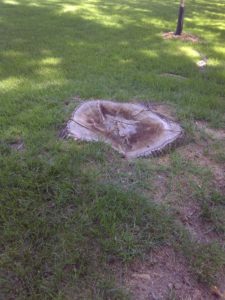 Do not grind the stump just 4-5 inches and cover with topsoil because grass roots will need to grow much deeper for grass to grow. Remove as much of the sawdust as possible. Decomposing sawdust consumes soil nutrients and makes it very difficult to grow grass, even with added fertilizer. Fill the hole with topsoil before seeding. As the tree roots decompose, the area will naturally sink so you may want to plant seed a couple inches higher than the surrounding area. The picture on the right shows the ground stump hole before filling with soil. 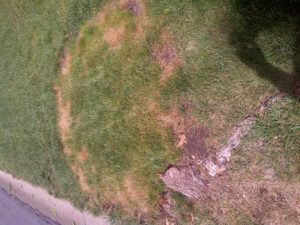 Grass seed was put down March 10 and the picture below, taken June 17, shows grass dieback where the stump could not be ground as deeply as the middle, and the grass is struggling from lack of roots. 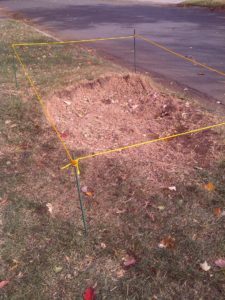 Beware this problem gradually goes away as the tree roots decompose, but it can take years. We’ve had quite a few calls about Blossom End Rot on tomatoes and peppers. This is a disorder caused by a calcium deficiency and uneven watering. 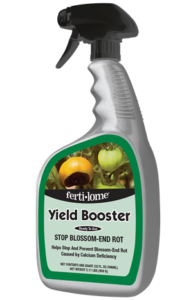 Ferti-lome Yield Booster is a liquid calcium sprayed at fruit set. 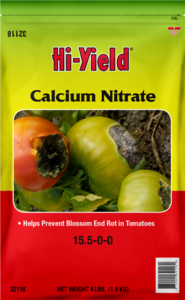 Even better, use Hi-Yield Calcium Nitrate at planting next year and again a few weeks later. A Potting Soil That Rocks! There are now 2 versions of Strawberry Fields: The first was way back in 1967 when the Beatles released a hit single “Strawberry Fields” (with “Penny Lane” on the other side, and again on the Magical Mystery Tour album). 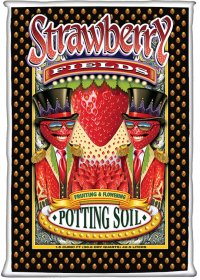 Fox Farm’s Strawberry Fields is a combination of Ocean Forest potting soil plus coco coir and mycorrhizal fungi found in their Coco Loco potting soil. It’s the best of both worlds and available now at the Garden Center.